The coins view has a menu item commonly known as an Action menu. This menu presents a list of Actions that apply to the current view. 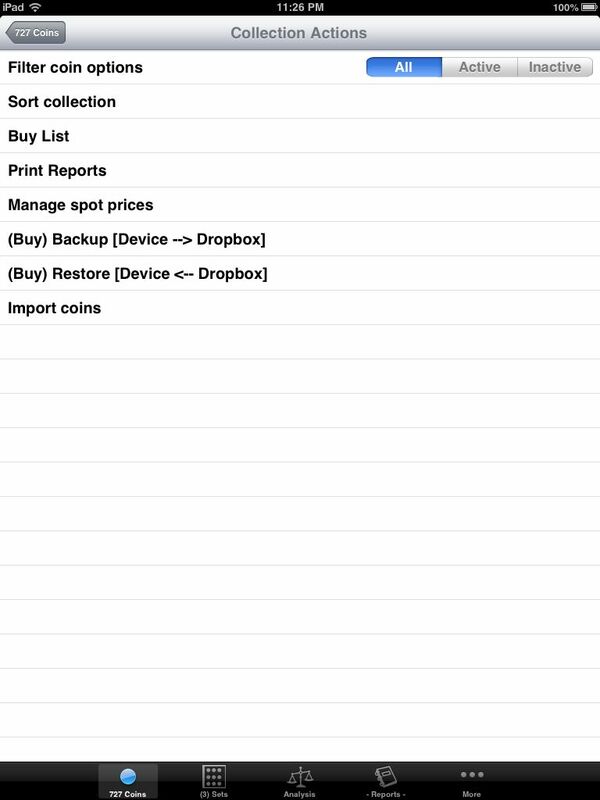 For the Coins view, this includes things like Filtering, Sorting, as well as more general functions including displaying a Buy List, Printing Reports, Managing Spot prices, Backup and Restore of your collection using DropBox, and Importing coins contained in CSV formatted files. Each coin has a status switch which can be used to indicate whether or not the coin is currently Active, that is, part of your collection, or perhaps has been sold and therefore, become Inactive. The Filtering options control how the App handles coins relative to this Active status property. Customers may desire that coins they have Sold remain as part of their collection database, for historical tracking. Rather than requiring them to delete Sold coins, we provide the option of allowing them to change the Coin Active status to be Inactive (Active = Off). To hide Inactive coins, change this Filtering setting to Active, and there-by filtering out any coins which are no longer active. The default setting is All, meaning, display and report on all coins, active or inactive. Ordering of the coins displayed in the Coins view can be changed using the Sorting option. This is fairly straight forward, simply select the property you want to sort on and the App takes care of the rest. What may be less obvious is how to sort by two properties. To accomplish this, sort first by one property and then by the other. Experiment to get a feel for how this works. This Customer requested report is very useful for when you attend Coin Shows, and you are looking for a specific Coin or Coin(s). A coin appears in this view when it's in a Set and the coin does not have a Cost entered. This provides another way to open Reports, does the same thing as touching the Reports tab. Spot price is used to price common gold and silver, as described in the Value property here. For customers without access to the Internet, we provide the ability to manually enter Spot prices and to enable manual resolution of Spot prices. The Backup and Restore feature are two sides of the same coin. Use Backup to backup a complete copy of your collection data files, including the Photo's associated with your coins. Restore then grabs the Backup and restores it to either the same device, or a different device. This is a handy option for Customers that like to use the App on multiple different iOS Devices.